When we talk about Tuscany we can’t avoid of mentioning the word “wine” that has always accompanied its reputation in Italy and in the world. Among the many varieties the noble Wine of Montepulciano (Vino Nobile di Montepulciano) stands out: it is a red wine produced in the Municipality of Montepulciano in the province of Siena. It is considered one of the oldest and best quality wines of Italy. As evidenced by the sources, its origins date back to the Etruscan age, to 789, and multiple documents – one of which even dates back to 1350 – refer to it in relation to commercial activities and exports. Since ancient times it was possible to understand its potential in the enological world to the point that the poet Francesco Redi called it the “king of wines”. As always behind every name there is a story and, in the case of Montepulciano wine, the formal use of the “noble” adjective which – though always associated with it did not represent its actual institutional denomination (which was in fact “chosen wine of Montepulciano “until the ’30s) – is due to Adamo Fanetti, considered the first producer of noble wine of the twentieth century and advocate of the written label to which the other wineries would have followed. Its being “prestigious” is confirmed by the fact that it is not produced in large quantities: the vines from which it derives, which belong to the category of Sangiovese or Prugnolo Gentile due to the intense perfume of Plum, must have very precise characteristics like that of the height with respect to the sea level (between 250 and 580 meters) in which they must be cultivated strictly following traditional methods (such as the Guyot espalier). The characteristic alternation of sands and clays of the territory is crucial for production. About two years of maturation are required, at least one in wooden containers and the quality controls for the maintenance of the high standards are very strict. It also undoubtedly marked an important turning point in broader terms in Tuscan wine production, where Chianti, which had always held the record, had to leave room for this new competitor. 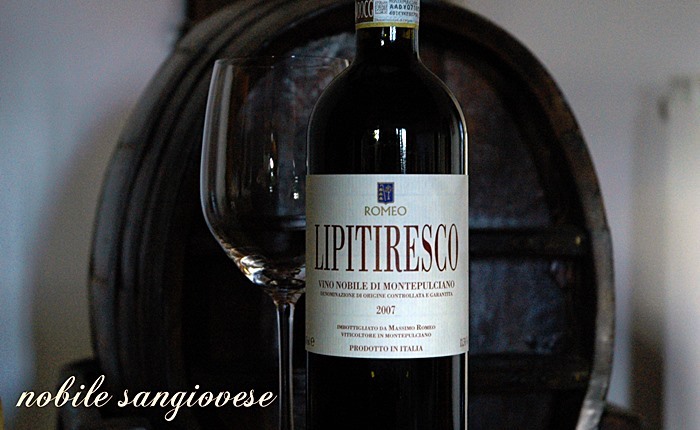 The Noble Wine of Montepulciano is characterized by the ruby ​​color that tends to darken with aging, an intense bouquet based on plums, cherries, olives, violets, herbaceous and earthy notes and a strong, intense but balanced flavor. The rosy future that has been glimpsed in this Noble Wine since ancient times has been confirmed in important achievements as the DOC denomination in 1966 and the DOCG in 1980 holding the Italian record. Wine lovers but not necessarily experts will then be interested in knowing which dishes of Tuscan cooking is possible to combine with the Noble Wine of Montepulciano. 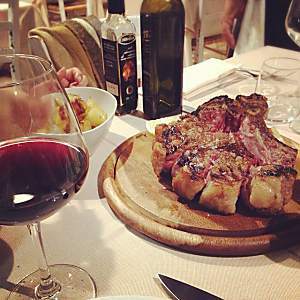 The combination for excellence is certainly the one with the Florentine steak but there are many options available such as roast white meat, braised meat, poultry and noble poultry, hard cheeses such as Grana Padano, Parmigiano Reggiano, or matured as Pecorino Romano and that of Pienza and, finally, Emmenthal, Groviera, Montasio and Sbrinz. In particular, we highlight the Biological Company of Massimo Romeo and the Priorino winery. The first, Romeo’s winery is a small winery, located in Montepulciano, with a production of about 25,000 bottles and the first noble wine of Montepulciano dating back to 1982. The bio certification stems from the precise desire of the owner Massimo Romeo to protect the territory as an ethical duty through an agriculture that preserves nature and supports biodiversity. The second, Priorino winery however, a few meters from the center of Montepulciano, is a small winery where the owner Jacopo is committed to the creation of high quality wine by following all the steps of a real craft workshop. The noble Montepulciano “Viola” wine stands out, whose ripening process takes place in French oak barrels, with the characteristic floral notes of violet.